There are so many colors of truth: White lies, grey areas, lies by omission, exaggerated truth, and complete fabrication. Which kind of liar are you? Who me?? Yes, you! Don’t be so shocked. We all lie. We just get so used to it, that we don’t even consider it lying. Telling your kid their drawing is gorgeous, appeasing a boss with a twist of the truth, protecting yourself from pain or conflict—all of life’s scenarios present us with an opportunity to alter the truth as needed. 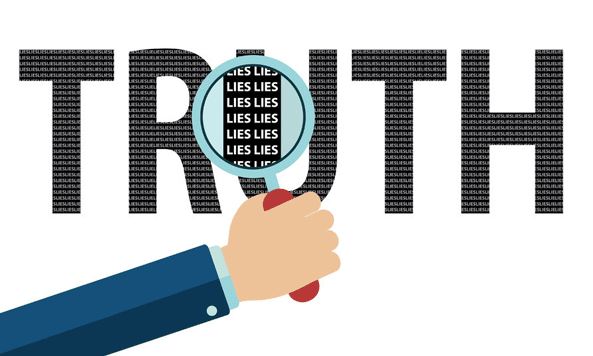 When it comes to your work and career, the truth is a challenging game. Outside of workplace politics, the truth about our level of satisfaction is often an intricate story we tell ourselves. It’s not always based in truth. No harm done, you’d think. However, the truth is hard work. Once you tell it, you have to live up to it or go back to the safety of denial. I help people tell the truth and discover its liberation, and that it’s not as horrifically scary as they fear. Well, that’s not true. It is horrifically scary, but it’s necessary. It’s essential to getting to the other side of a very brave journey – to arrive in that place where you’ve told the truth, dealt with the fear, taken action anyway and can now live in the new world with a whole new level of satisfaction. In my twenties, facing the truth that I could no longer withstand the lifestyle required to pursue my theater dreams was one of the hardest truths I’ve had to face. Once the battle with admitting the truth was over, I could move forward. I didn’t have a clue as to what I’d do next, but finally admitting that I wasn’t where I wanted to be and I wasn’t willing to keep slogging, allowed me to be open to new ideas. One of them was to call an old mentor. He had become a coach – I had no idea what a coach was – the rest is history. What is truth? How can you measure it? It’s often elusive, but telling the truth can clear the way for a greater truth to be told. The line keeps on moving. The truth can be blurry, so who exactly gets to decide what the truth is? What’s true about your career or life situation? Does it sit well with you? If the answers are yes, you’ve made great strides. AND when you take the time to ask these questions, you are measuring your happiness by a different standard. How it feels versus how you think it looks. The idea that “the truth will set you free” suggests that in the telling, you are opening up the dam of blocked energy and ideas. It means you can stop holding your breath and instead allow the brain and body to be engulfed in the oxygen that will help generate ideas and action. Just as you can’t drive a car with a block in the gas line, you can’t operate smoothly in life with the truth buried deep in your being. It has to come out in order to move your life forward. Are there consequences to telling the truth? There sure are. I can say with great certainty that even if the ride is bumpy and hard to start, maybe even painful, the work will be worth it. As Robert Frost said: “The only way out is through.” You will get through and things WILL be so much better. So, if nothing is moving in your career or life the way you want it to, it’s time to tell the truth. We’ll get it out of you. It won’t hurt as much as that last sentence made it sound like it would. Give us a call.